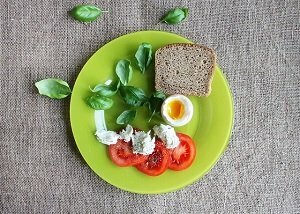 It's a common dietary trap to eat or snack from boredom, when you are not really hungry. Chewing sugar-free gum such as Mentos gum is a great alternative, an easy distraction from binge or stress eating. 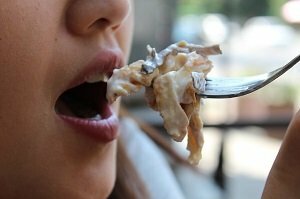 You are still putting something with flavor in your mouth and chewing it, but without the fat and calories. So chewing gum is a healthy alternative to unhealthy snacking. Mentos is the only brand of gum I chew, which is why I am singling it out in particular here. But any sugar-free gum will serve to beat a craving. Mentos has several sugar-free flavors that I enjoy. The sugar-free version has 40% fewer calories than regular gum. My favorite flavor of Mentos gum is the sugar-free Tropical, which has a soft center and gives you a burst of a tropical orange fruit flavor. My next favorite is the sugar-free Red Fruit. It also has a soft center and gives off a sweet fruity taste. Many flavors of Mentos have real fruit filling. I am not a big lemonade fan, so the new sugar-free Cool Lemonade is not high on my list, but those of you who enjoy lemon-head candies may like the lemonade flavor gum. I know a lot of people prefer gum that freshens your breath. The sugar-free Sweet Mint, Wintergreen, Fresh Mint, or Spearmint flavors of Mentos gum will do the trick. For those that like the traditional pink bubble gum, you may enjoy the sugar-free Bubble Fresh flavor. I like that Mentos gum has a hard outer covering that gives you a little crunch when you bit into it, and many of the flavors have a soft center. The container they come in is very useful and cute too. The gum dispenser is durable, hard plastic with a flip-open lid. It keeps the gum fresh and is always easy to find if you are carrying it in your purse or bag. The containers are attractive colors. 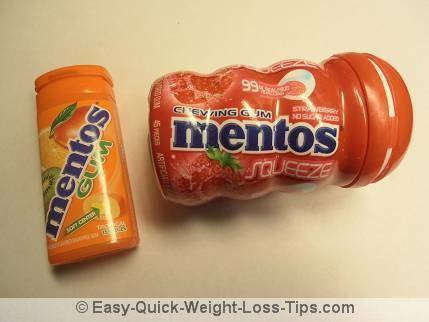 My favorite tropical flavor Mentos comes in a neon orange container with bright pictures of tropical fruit on the front. Many of the flavors also contain green tea extract in the soft center of the gum. As we know, green tea has weight-loss benefits. The tropical flavor Mentos gum must be very popular, because I have a hard time finding it stocked in stores! The stores that carry it in my area always seem to be sold out. In the future, I may order Mentos online and save money by buying in bulk. The next time you have a craving for chips, cookies, or other fat-food snacks, why not do what I do? Pop a piece of bursting-with-flavor Mentos gum or your own favorite sugar-free gum.